Home » Headlines » FALL in love with pumpkin spice! FALL in love with pumpkin spice! It's starting to get colder outside as we get closer and closer towards Winter! I wanted to celebrate what we have left of Fall and remind everyone Winter isn't here yet. Even though this past week, it sure felt like it. I knew I wanted to do something with pumpkin spice k-cups because NOTHING says Fall like pumpkin spice! I also knew I wanted to use real leaves. This idea had been swirling around my head all week and on Friday, a day away from show time, I remembered this awesome pumpkin my co-worker Tina Lloyd had displayed in her cubicle. Thanks to Tina and her loner pumpkin I was ready to get started. I woke up this morning and carefully selected some leaves from my neighbors tree while wearing my pajamas and clutching a coffee mug and then ran inside (before anyone felt the need to call someone) and set to work. I think the result was a success! 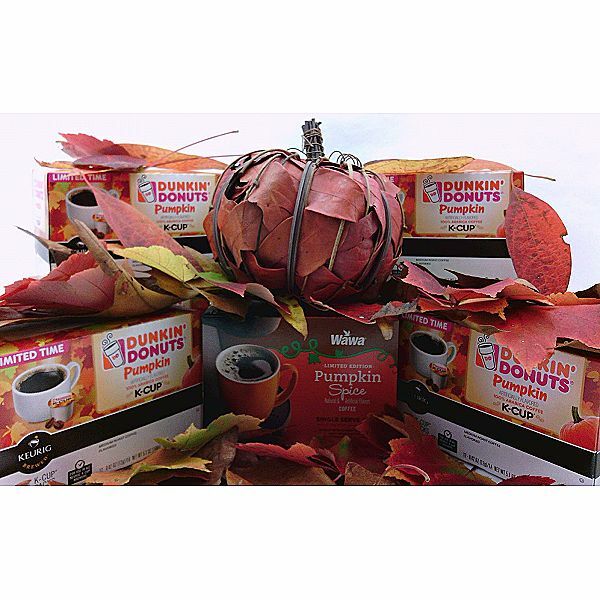 And to celebrate we created a coupon code, PUMPKIN10 to save 10% off your favorite pumpkin k-cups! Enjoy this coupon code along with your favorite pumpkin spice coffee all November as we celebrate the remainder of Fall! 0 Comments To "FALL in love with pumpkin spice!"